The design, shape, size and material of the boat prop you choose will make all the difference in maximizing the performance of your boat. Choosing the right boat propeller for your vessel can be confusing when you see all the options available for hub, pitch, diameter and blade. Read through our comprehensive guides below to help you make an excellent propeller choice from the start. In order to maximize your boat’s performance and fuel efficiency, the right prop has to be matched with your particular boat’s engine. Determining the correct size and style of boat prop will keep your engine operating within its recommended RPM range. This not only allows optimal horsepower to be applied to the water, but also makes for improved handling. The kind of prop your engine needs depends largely on how you’re using your boat. Whether fishing, cruising, or water skiing, different applications place different loads on your engine. Regardless of application, the key is to keep your engine within its factory-recommended wide-open throttle (WOT) RPM ratings, which are easily found in your owner’s manual. Selecting a prop with the right pitch, diameter, rake, surface area, and contour for your engine will keep you within your RPM range. For an informative read about how the correct propeller can change your boat’s performance, take a look at this Popular Mechanics’ article that compares six different props using the same boat. Already have an idea of what you’re looking for? Get started now by using our handy Prop Selector Tool to narrow your search results. Our Prop Selector will choose exactly what you need from our wide selection of boat props from quality brands like PowerTech, Solas, and Michigan Wheel. Testing your propeller’s performance is simple, not to mention fun. When you have the right propeller for your boat, and it’s functioning properly, your boat’s engine should operate as expected. This means that your engine should run within the manufacturer’s designated RPM when running at Wide Open Throttle (WOT). If this doesn’t occur, you probably need a new prop for your boat. Make sure your gas tank is full, but that the overall load in your boat is “normal.” Do not test with the maximum number of people on board, but make sure the load accurately mimics what you normally carry. Run your boat for at least 5 minutes to ensure your engine is properly warmed up. Find a wide open piece of water with little or no other boat traffic. Give your engine full throttle and get it up to maximum speed. When at maximum speed, note and record your RPM. Take a run in the other direction, repeating steps three through five. Taking two measurements and averaging them ensures a more accurate reading by eliminating factors such as wind and current. Prop diameter is the distance it takes a blade to rotate from a 3 o’clock position to a 9 o’clock position (a semi-circle). To determine your prop’s diameter, measure from the outside edge of one blade straight into the center of the prop shaft, then multiply that number by two. This is your diameter. Changes in diameter can affect the way a boat carries itself. Usually, the lower the pitch (which we’ll talk about next), the greater the diameter. 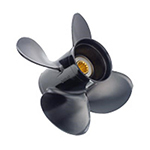 Smaller diameter propellers spin faster, making them a good choice for performance boats that need higher top-end speeds. In most cases, the diameter and pitch will be stamped on the hub of your prop. Large or small, diameter is the first number listed. A prop noted as 14 x 17 x 3 means the prop has a diameter of 14", a pitch of 17", and has three blades. Pitch controls your engine’s RPM (revolutions per minute) and is the final “gear ratio” adjustment on any given boat. It also affects the performance of a propeller more than any other aspect. Specifically, pitch is "the distance a propeller would move in one full revolution if it were moving through a soft solid, like a screw through wood,” assuming there is no slippage. For example, a 21-pitch propeller would move forward 21 inches in one revolution. 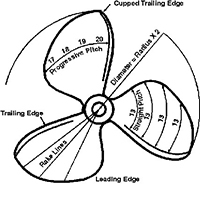 Propeller slip (slippage) is the difference between actual and theoretical propeller travel. Slip happens with every propeller, though the amount shifts depending on overall design. **Note: Sustained operation with a pitch that’s either too low or too high can cause damage to your engine. For more in-depth answers to specific inquiries about pitch, like “what’s the right pitch for my specific motor?,” please visit our Commonly Asked Questions page. There are pros and cons to both aluminum and stainless steel boat props. In order to determine which material best suits your boating lifestyle and budget, have a look at our comparison chart below. 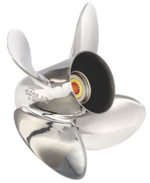 Three or four-blade props, how do you know which to choose for your boat? It’s all about compromise and goals. As described above, 4-blade props generally translate to a faster hole shot and reduced vibration, albeit with less steering torque. 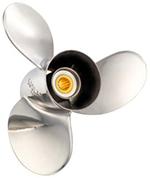 When a maximum top speed is the goal for your stern drive or outboard boat, 3-blade props are usually the best option. For a side-by-side comparison of 3-blade vs. 4-blade props, take a look at our chart below. Regardless of the reasons to opt for a three or four-blade prop, doing on-water testing in repeatable conditions is the way to go. On-water testing is the best way to achieve the most accurate blade selection for your boat and its particular application. Plus, it’s another excuse to get out on the water! To note, this useful article in Sport Fishing Magazine recommends checking other factors that might be effecting your boat’s performance—hull fouling, lack of adequate power, or improper weight distribution—before moving on to propping. The hub is the center of the boat propeller where the blades attach. The center of the hub will slide over the propeller shaft. In many cases this is the point where exhaust exits the engine. The propeller’s cup is the curved lip on the blade tip. Cupping a propeller will cause a decrease in RPMs, giving it high performance and minimizing cavitation under heavy loads. Propellers spin right (clockwise) or left (counterclockwise). 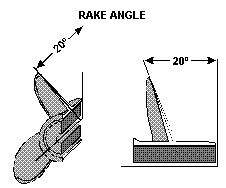 Rake is the angle of the tip of the blade’s tilt forward or backward in relation to the hub. The angle is measured on a line extending from the center of the hub through the center of one blade. 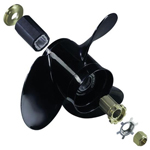 Backup your boat propeller, just like you have a spare tire in your car. All-around performance propellers are typically a great option for backups. Replace old, worn-out propellers. 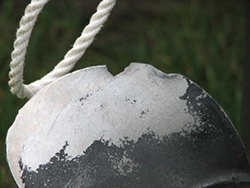 Running on a bent, chipped, or pock-marked prop will lead to cavitation as well as expensive damage to the engine and stern drive. Inspect your propeller regularly for bent blades, nicks, and rolled tips, as well as any mud, aquatic plants, or animals. 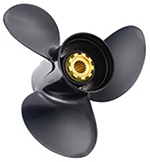 Grease the moving parts of the propeller with a marine-quality waterproof product. Use the grease before fitting the boat prop and as part of your routine maintenance procedure. 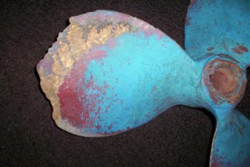 Cavitation is any erosion, pock marks, or irregular edges on the surface of the propeller. When a pocket of air forms on the backside of a propeller blade, the impact of air bubbles on the actual blade causes cavitation. This usually happens when a propeller’s RPMs are too high for its design. 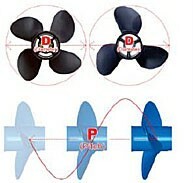 The best way to avoid cavitation is to choose the correct propeller pitch for your engine. You can also reduce the chances of prop cavitation by opting for stainless steel, or by going with blades that offer a cupped design. Damage from soft material can also lead to cavitation—not to mention reduced fuel economy and a drop in overall efficiency. A stainless steel prop will hold up to silt and sand exposure, and thus cavitation, very well. Vibration usually comes from one of four things: the propeller, the engine, the shaft, or the shaft supports. Though these other factors shouldn't be ignored, the number one culprit tends to be the propeller. Prop vibration can come from several root causes, including imbalance, a worn hub, insufficient tip clearance, or inadequate blade area. Cavitation is another common cause of boat prop vibration. When a prop has insufficient blade area, the blades get overloaded. This causes cavitation, blade erosion and, ultimately, vibration. For a great article that covers several key boat prop troubleshooting points, take a look at this one, Fixing Boat Propeller Problems, from BoatUS.com. Ready to find the best prop for your boat? Use our handy Prop Selector Tool to narrow your search results from our wide selection of quality boat props from PowerTech, Solas, and Michigan Wheel.